My husband and I have been binge-watching the TV show The West Wing. If you don’t know about this fictional show from the late ’90s, it’s awesome! It’s about the behind-the-scenes of the presidency, including the staff and their roles, and all the many stressful things the West Wing deals with while the rest of us go about our day. Recently, one of the episodes we watched was about the Press Secretary and her father’s battle with Alzheimer’s disease. The name of the episode was “The Long Goodbye”. This episode not only made me think about my own experiences with Alzheimer’s, but also my clients. I have so many clients who have loved ones that have received this diagnosis. Caring for someone with Alzheimer’s can be painful, hard, and full of grief. Today my hope is to offer some encouragement and support in case you love someone with Alzheimer’s or Dementia. Before we continue, I think it’s important to discuss what the difference is between Alzheimer’s and Dementia. According to the Mayo Clinic, Dementia is an umbrella term for symptoms of impaired thinking and memory, usually associated with aging. Dementia in and of itself is not a diagnosis. It is characterized by the following symptoms: a decline in memory and thinking, poor judgment, minimal reasoning skills, a decrease in attention, a decrease in focus, and changes in communication skills. Many health issues can cause Dementia, including other diseases (Parkinson’s disease, strokes, etc). Alzheimer’s disease is just one form of Dementia but accounts for 60-80% of cases. Alzheimer’s disease is a physical disease that impacts the brain. It causes plaque tangles to build up within the brain, so the nerve cells cannot communicate with one another and eventually die. As the nerve cells die, so do different abilities. Alzheimer’s disease usually starts off very slow, with mild memory loss. Eventually, it progresses to loss of verbal skills, and the ability to physically care for themselves. As it progresses, loved ones require constant around the clock care. 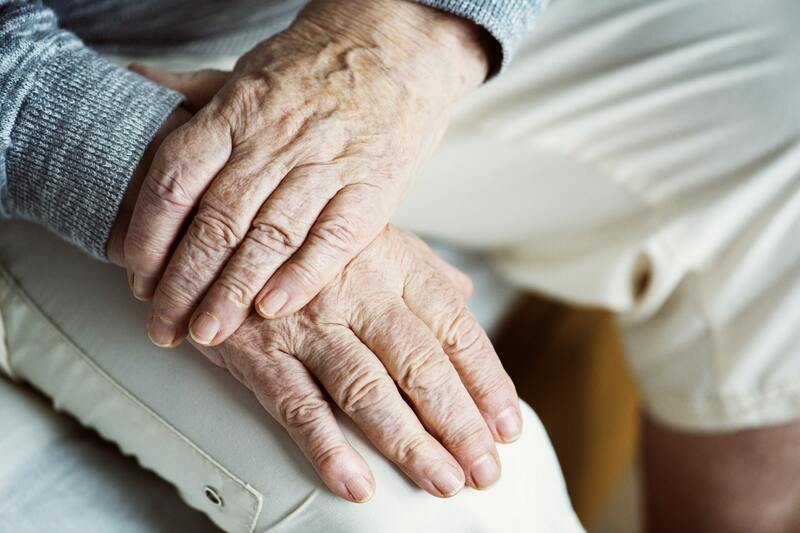 1 in 10 individuals over the age of 65 have Alzheimer’s disease, and 1 in 3 over the age of 85 have it, according to the Alzheimer’s Association. The reason Alzheimer’s is referred to as the “long goodbye” is because it is the longest goodbye you will ever have. Let me explain. When someone receives an Alzheimer’s diagnosis, the grieving process starts. This begins the loss of what they thought their life would look like. Maybe they had plans to travel, take care of grandchildren, or enjoy their retirement. Their spouses grieve as well. They know that eventually, the person they’ve been with will not remember them. That they will now become the caregiver at some point for their spouse. That the hopes and dreams they’ve worked so hard for together may not come to fruition. Adult children grieve when their parents receive an Alzheimer’s diagnosis. This is the loss of the parent they’ve known their whole life. They grieve, knowing that they may eventually become the caregiver for the person who helped raise them. Grandchildren grieve, friends grieve, and a community grieves when someone receives an Alzheimer’s diagnosis. According to the Alzheimer’s Association, most people with Alzheimer’s disease will live 4-8 years after the diagnosis (however, some can live up to 20!). Imagine grieving someone for that long, all while they are still there in front of you. No, they are not the same person, but rather a shell of a person you once knew. This is the long goodbye. When you experience an ambiguous loss, you grieve the loss of something not tangible. With Alzheimer’s disease, it’s common to grieve all the different layers of losses. At first, you grieve because you know that eventually, the loved one is going to deteriorate. Then, as they do, you grieve the things they lose or can no longer do or remember. You grieve the person they once were, the relationship you once had, and the future that no longer exists. The Stages of Grief are Denial, Anger, Bargaining, Depression, and eventually Acceptance. You can experience the stages in any order, multiple times over, sometimes hourly. Denial is “this isn’t real, this isn’t happening”. Sometimes it’s shocking. Anger is just that—being angry at God, everyone, the world—maybe even your loved one with Alzheimer’s. It’s just not fair. Bargaining is questioning. “What if _______?” It’s trying to make sense of something that doesn’t make sense. Depression is sadness, crying, and feeling down. Acceptance is finding some peace with the situation, and with the inevitable outcome. It takes a long time to reach Acceptance. There is not a right or wrong way to grieve. It looks different for each person. Just make sure that you are allowing yourself to grieve as you need to. Don’t bottle it up because it’s too much to deal with. If it feels like it’s impossible to grieve, seek professional help. Taking care of someone with Alzheimer’s disease is exhausting, physically and emotionally taxing, and complicated. It’s not unusual to try to keep the person with Alzheimer’s in their routine and their normal environment at home for as long as possible. While this is great, it can cause a lot of caregiver stress for those who are taking care of them. It’s very common for those that are caretakers to struggle with anxiety and depression while balancing grief, and your own life and responsibilities. If you are someone caring for a loved one with Alzheimer’s, please reach out for help. You don’t have to walk this journey alone. Alzheimer’s Association. There are local chapters, lots of information, support groups. Alzheimers.Net. Check it out for connections to caring for your loved one, as well as information and blogs.